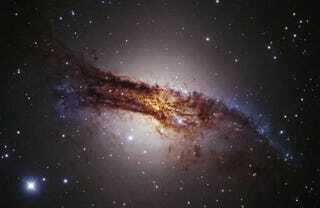 Centaurus A not only has a terrifying name, it's our nearest "giant galaxy," only 13 million light years away. Its superluminous central area comes from a supermassive black hole, and it's already swallowing a neighboring spiral galaxy. How long before it comes and pwns us?